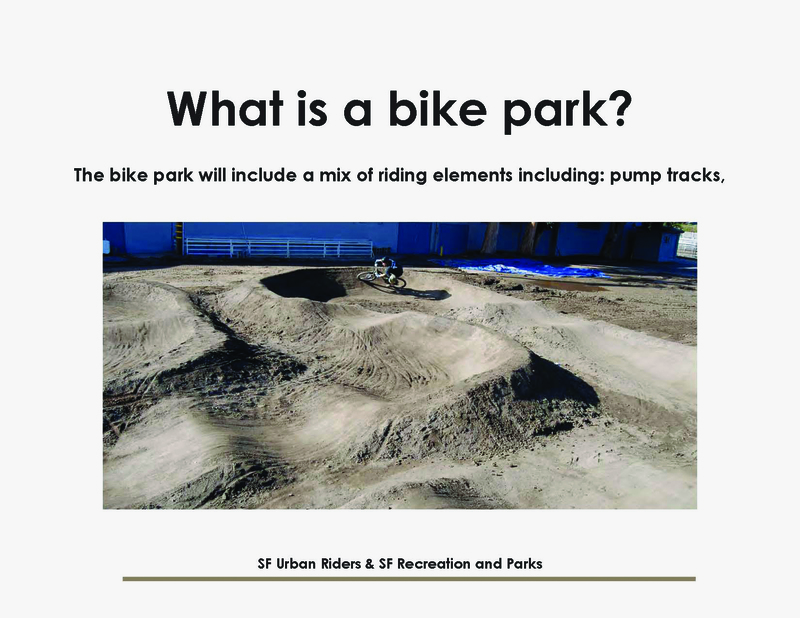 On November 16th, SF Urban Riders and the San Francisco Recreation and Parks Department held their first community meeting to discuss the possibility of a bike skills park in McLaren Park. The area in consideration is the partially paved unused area just outside Glen Eagles Golf Course along Sunnydale Ave. 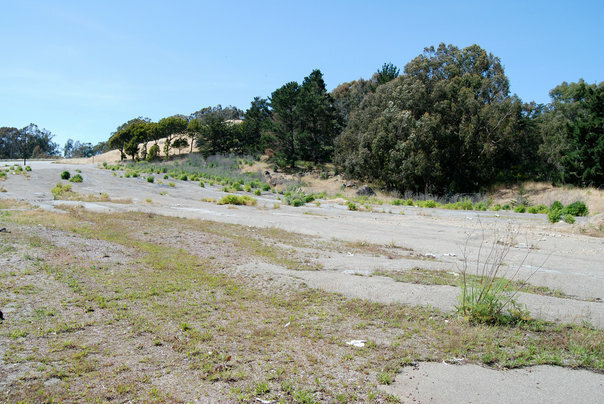 This meeting is a huge step towards the realization of the first bike park in San Francisco. Over the course of the last year, there were a series of McLaren needs assessment meetings where bikes were not on the agenda. These previous meetings focused on sidewalk improvements, play areas, and general park maintenance. All very much needed, by the way. But, SF Urban Riders turned out a majority of bike park supporters that raised their hands, commented, and ultimately made their voices heard. The November 16th meeting was the culmination of the community support received at past meetings. Sometimes it may seem like a long road, and it may not seem like coming to a meeting and listening makes a difference, but this is proof that it does. Thank you to all have helped get us to this point. At the Nov. 16th community meeting SFRPD Sports and Athletics Manager and native McLaren resident Bob Palacio, opened the meeting and told of McLaren Park’s BMX past. He handed off to SFRPD’s Leisure Services Manager, James Wheeler who explained his recently created role and the Extreme Sports programming that SFRPD is looking to create. He then introduced SFUR’s Executive Director, Dan Schneider and MBP Project Manager, Dustin Smith who presented the case to local community groups, leaders and families from the neighborhood surrounding McLaren Park. The centerpiece of the presentation? Kids, bikes and more kids. Kids are the future (sorry to sound cliche’) and our future relies on getting kids outside and on bikes. As proof of SFUR’s commitment to the kids and the community, a dozen or so past SFUR events were showcased in the presentation such as the Vis Valley Street Fair, Take a Kid Mountain Biking Day, McLaren Wrench Day, the SF Bike Expo Pumptrack and numerous trailwork events on Mt. Sutro and at McLaren Park itself. Pictures and stories of these events, as well as a strong partnership with the YMCA and SFRPD in creating kids mountain bike programs, demonstrated that SFUR is not a fly-by-night group of self-serving cyclists. We’re here to build a bike park AND strengthen the community and it’s children. The presentation itself was also designed to explain exactly what a bike park looks like, who might use the bike park, and how it could benefit the community. Overall, the project received much support that Tuesday evening. There were many questions and comments about how a bike park would affect current paths and trails. Points of concern were the Sunnydale housing and how a bike park would serve it’s residents. And how bikes flocking to the bike park would affect traffic on the trails. Dan, Dustin and James responsed to those questions as best as possible, but a more detailed follow up will be posted shortly for public viewing. Of the many positive comments a few favorites (paraphrased) were: “Are you sure this space is big enough?” and “That asphalt dumping area has been there for at least 20 years. Now you’ve got a group that wants to come and make something useful out of it? I say we should let them. And give them as much support as possible”. The latter comment was met with a room full of applause. Thanks again to everyone that came out to the meeting. There will be more meetings. And each will be more important than the last. So, if you want a bike park, it’s time to get involved. Please stay tuned for next steps and future meetings. We’re working on a park in Houston, TX. May we have a look at your “What is a Mountain Bike Park” presentation?